This stunning Amish Queen Anne style hutch is one of our most popular and elegant styles of furniture, dating back to the 1700's. The curved lines and sophisticated design make this hutch a favorite among our customers and one that they are always proud to display as part of their home furniture collection. 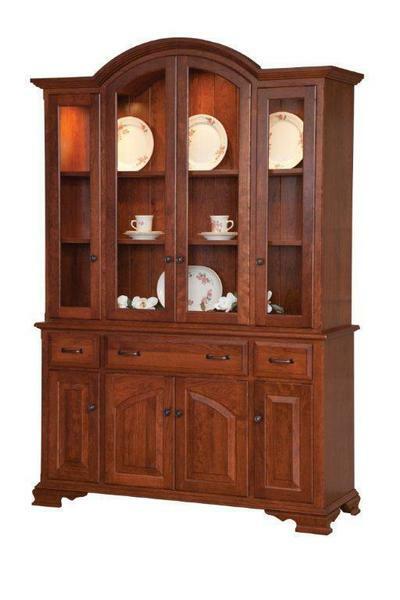 This beautiful hutch is completely handcrafted by our skilled Amish woodworkers from your choice of either solid oak, brown maple, walnut, or cherry wood. Choose from our variety of optional features to create a custom look unique to your home alone. The Queen Anne hutch top is finished with beautiful crown molding and the curved top panel is built from a two-layer solid wood veneer that is the same species as the rest of the hutch and is bent to create the unique curved top to match the beautiful Queen Anne style. This hutch has hidden hinges and full extension drawer slides as well as an upgrade option of full extension soft closing under-mount drawer slides. Wood shelves are standard on the inside of the hutch but you can select glass shelves, touch lighting and mirror backing as well. The base has three dovetailed drawers and four doors, all adorned with attractive hardware. The bottom doors also have a decorative engraved inset and the standard hutch top back is a beautiful solid wood tongue and groove backing. The bottom section has a solid plywood back, which helps to reduce warping or buckling. Contact our DutchCrafters team of Amish furniture specialists for additional information, custom ordering assistance, or to have wood and stain samples sent to your home or business.